Create models of Earth's time changing magnetic field by combining crowdsourced magnetic data with data collected by ships, aircrafts and satellites. Map local magnetic noise sources (for e.g. power transformer and iron pipes) to improve accuracy of the magnetic navigation systems. 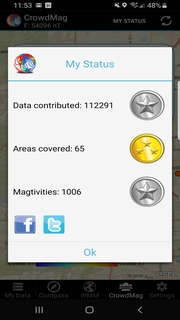 Success of CrowdMag project depends on participation by citizen scientists like you. Become a citizen scientist and join our research on the Earth's geomagnetic field. 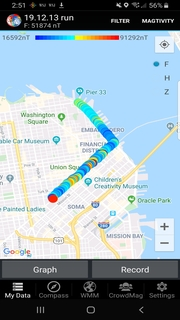 The video below shows how your everyday activity paired with the CrowdMag smartphone app will help improve navigation for everyone. 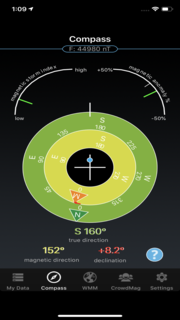 In this era of GPS and other geospatial technologies, what is the need of a compass? 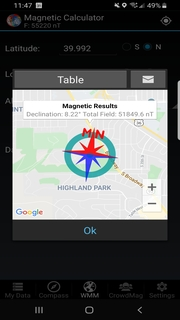 For a stationary device, GPS does not provide pointing direction. Satellite signals can be jammed or masked. For example, it is difficult to get GPS signals underwater. Earth's magnetic field (geomagnetic field) provides us an all-weather referencing system.Earth acts like a great spherical magnet and its magnetic field resembles, in general, the field generated by a dipole magnet (i.e., a straight magnet with a north and south pole) located at the center of Earth. The geomagnetic field has been observed and used for navigation since ancient times. 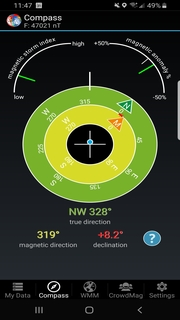 Today, magnetic navigation is implemented on most planes, ships and even on your smartphone for safe and reliable navigation. As the geomagnetic field changes with time and space, it is important to monitor its changes. Scientists use observatories, satellites and ship/airborne surveys to keep track of the change.Due to gaps in coverage - both in time and space - scientists are always looking for alternative ways to obtain geomagnetic data. 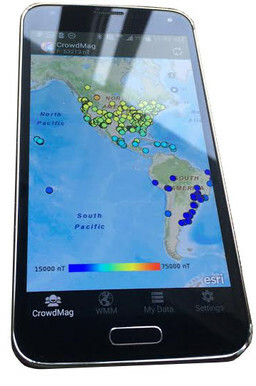 CrowdMag mobile applications can potentially improve magnetic field models and magnetic navigation by filling data gaps with existing technologies that capitalize on citizen science. Science quality magnetic data are collected with low-noise sensors in relatively noise free environment. With such practices, an accuracy of about 1 nT is routinely achieved. However, a phone's magnetometer also senses noise from currents flowing its electronic circuits. Man-made magnetic noises sources (e.g. electric transformers, power lines and car) can also overwhelm the natural magnetic field. 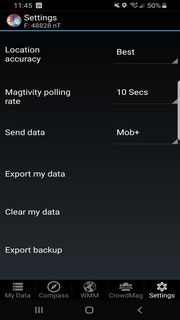 Additionally, a phone's magnetometer has significantly lower sensitivity than a sensor used for measuring science quality data( ~300 nT compared to ~0.1 nT). All these factors make it difficult to separate noise from the geomagnetic field in phone's magnetic measurements. This is where we need your help. 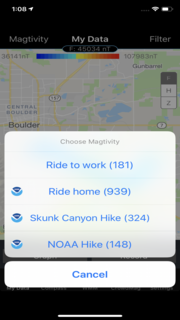 By sourcing magnetic data from a large number of users, we hope to reduce noise in the data. The geomagnetism group of NOAA's National Centers for Environmental Information (NCEI) conducts original research on the magnetic field of Earth. Our primary goal is to create and update models of the geomagnetic field to keep pace with Earth's constantly changing magnetic field. 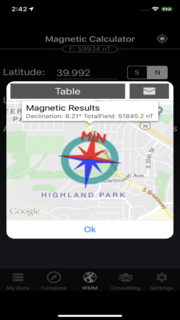 Our magnetic models are integrated into millions of smartphones, car and aircraft navigation systems and GPS so that users know which way is north. Frequently asked questions on geomagnetism. CrowdMag data are stored (for a foreseeable future) in an internal, non-public database at the NOAA's National Centers for Environmental Information, Boulder, CO, U.S.A . Our magnetic field research team will use these data to assess the utility of using crowdsourced magnetic data for modeling the magnetic field. They will periodically make science products such as maps, graphs and/or mathematical models using CrowdMag data. In order to further magnetic field research, these products may be presented at meetings, be included in publications, or be made available to public via Internet. 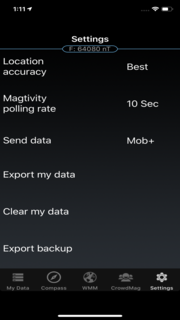 This map shows data collected from phones around the world! 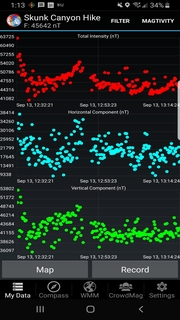 Displayed is the Crowdsourced magnetic data collected in the past 24 hours within a tolerance level of prediction by World Magnetic Model We have added some uncertainty to each data point shown to ensure the privacy of our contributors. This map is updated every hour. F channel represents Total Strength, H channel represents Horizontal Component, and Z channel represents Vertical Component. 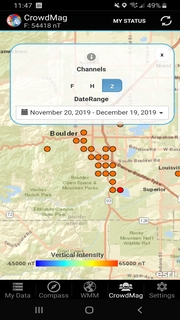 Use the menu on the top-right part of the map to get data for a different date range. Use your phone as a magnetic sensor! Here is an opportunity for you to be a part of our research on the geomagnetic field. 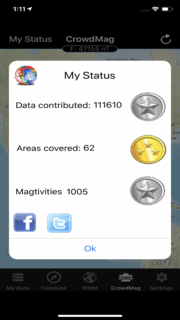 Install CrowdMag app and share your magnetic data. You can also view maps and graphs shared by other citizen scientists. Please send your feedback to geomag.models@noaa.gov.